Many opera lovers agree that Verdi’s penultimate opera Otello is one of the greatest of all times. I have counted myself in that category for well over a half-century, and even though I have a lot of other favourites it is to this work I return for the greatest satisfaction. My first recording was Karajan’s Decca set from 1961 with Renata Tebaldi, Mario Del Monaco and Aldo Protti and I still hold it in the highest esteem. Others have been added to the list: Panizza live from MET 1938 (Naxos et al), Toscanini (RCA), Karajan’s remake for EMI, two with Domingo conducted by James Levine (RCA) and Myung-whun Chung (DG) and a live recording under Alain Lombard with a magnificent Giuseppe Giacomini in the title role. Solti’s first has Margaret Price as a superb Desdemona (she also sings the role for Lombard) and a budget priced Cetra set from the mid-50s with Giuseppe Taddei as Iago is also worth owning. So competition is keen. Now here comes a brand new studio recording – a rarity today – with largely little known forces under the experienced Lawrence Foster. I haven’t associated him with opera in the past, but he has been Music Director of l’Opéra de Marseille since 2013 and he is a regular visitor to the opera houses in Frankfurt, Hamburg, San Francisco and Monte Carlo and was also hailed for his La traviata at the Savonlinna Opera Festival in 2015. The distance between the mainly chamber-size domestic setting in Traviata and the high-strung crime passionnel of Otello is of course wide but Mr Foster has, to judge from this recording, an unfailing sense for both the high octane drama and the admittedly few moments of true intimacy – primarily the duet that concludes the first act. The opening storm of the act is certainly one of the most thrilling scenes in the opera literature and here Foster goes on knock-out with tremendous force – maybe a notch too much, since Otello’s glorious Esultate! is almost drowned by the orchestra. This also happens in some other places where the adrenaline level is on top. Whether the fault is the conductor’s or the balance engineer’s is hard to know. I listened in traditional 2-channel stereo and it is quite possible that this problem is non-existent at multi-channel listening. What is very obvious throughout the performance is Foster’s care over details, bringing out Verdi’s many expressive point-making commentaries. Time and again he also makes the music come alive through rhythmical springiness. The Fuoco di gioia! chorus literally dances, and the drinking scene is springy and alert. For the lyrical moments he is just as sensitive. The chorus scene in act II is truly atmospheric with Desdemona soaring beautifully over the ensemble. I could point out numerous examples of exquisite flexibility, for instance the orchestral backing up of Iago’s credo. I don’t know how much opera the Gulbenkian Choir performs, but it is a large body with lots of heft when needed and a homogenousity that many a regular opera chorus could be envious of. The orchestra likewise has all the qualities one expects from a professional ensemble and there are many excellent solo contributions of individual musicians, not least the solo cellist whose playing at the opening of the first act duet Già nella notte densa is admirable. Which leads me over to the singers. The title role is one of the notoriously most difficult to cast, requiring not only a big heroic voice and stamina for the violent outbreaks in the second and third acts but also the ability to make something simple and beautiful of the first act duet and, most important of all, the verbal acuity and expressivity to bring out the senses and feelings of the Moor. Nikolai Schukoff has a lot of this in his armoury. His voice isn’t, or so it seems on this recording, that monumental instrument of a Mario Del Monaco (or far back in history Francesco Tamagno, the first Otello), but it has a lot of likeness with Del Monaco in the actual sound and timbre. In fact it seems that he has modelled his reading after Del Monaco’s in the first act finale, and he is more expressive than his predecessor – though Del Monaco was really good in the Karajan recording – and at the end of the duet he sings Venere splende with a true pianissimo. Really great. In the following acts he is also very good. He is furious in the second act, occasionally slightly strained, but his expressivity is truly telling. One believes in his state of mind. His venomous Datemi ancor to Desdemona is also believable and Dio! mi potevi is inward and deeply moving. This is a three-dimensional portrait of a person who runs out of his senses through the manipulations of an evil rival, and it is crowned by a Niun mi tema in the last act, so filled with pain, desperation, sorrow and resignation that he surpasses almost everything else I’ve ever heard, possibly bar Giuseppe Giacomini. Desdemona isn’t quite a full-size character of this kind. She is a mild, enamoured young woman who doesn’t really understand what is happening to her husband, but these feelings are very well expressed in Melody Moore’s enchanting reading of the role. I don’t know if she has studied Renata Tebaldi’s portrayal of Desdemona, but in the first act duet I seem to recognise quite a lot of the same phrasing. And there are worse models! Like Tebaldi she has a ravishing pianissimo and when on her own in her bed chamber before the murder she sings a wonderfully hushed willow song, with a brilliant Ah! Emilia, addio and an Ave Maria that not even God could have resisted. She has made a rapid career in the US and seems cut out for a great career. About Lester Lynch’s Iago I am in two minds. In the first act I found his delivery heavy and vibrato-laden but also authoritative. In the second act he is much better, with care over words and nuances and his credo is deeply involved. Era la notte – oily and insinuating – is really skilfully executed. So is also his handling of the proceedings in act III and by and large this is a reading worthy of the performance at large. I still can’t find his voice particularly ingratiating, but considering the evil character he creates this is no serious drawback. The rest of the cast is fully acceptable – though Cassio’s tone is rather bright and penetrating – and Polish Helena Zubanovich, who has an important career singing the big mezzo-soprano roles, shows emphatically in her few solo bars that she is luxury casting as Emilia. 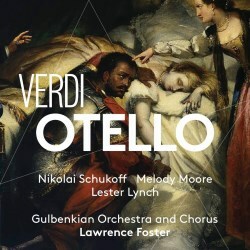 The half-dozen non-historical recordings I mentioned at the beginning of this review are all, for various reasons, highly recommendable but this newcomer is a worthy alternative, with in particular Nikolai Schukoff’s Otello and Melody Moore’s Desdemona challenging even some of the best of their rivals on the established sets. This box also includes a book of circa 100 pages with some illuminating essays on the work, artist biographies and a full libretto with English translations.